Having cute wedding shoes may be important, but comfort still matters a lot. Remember your wedding day you will be on your feet all day – whether walking or standing in front of the altar, taking pictures, cutting the cake, dancing at the reception, greeting guests, you will not be able to sit much during the day. 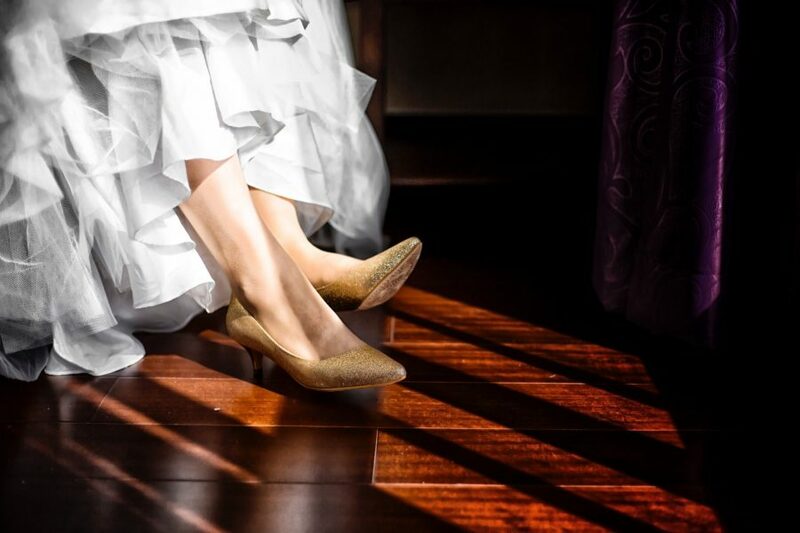 Thus having comfy shoes, will play a vital role in ensuring that your wedding day is successful. It might make sense to buy stylish shoes for the wedding and another pair of comfortable reception shoes for the party later. 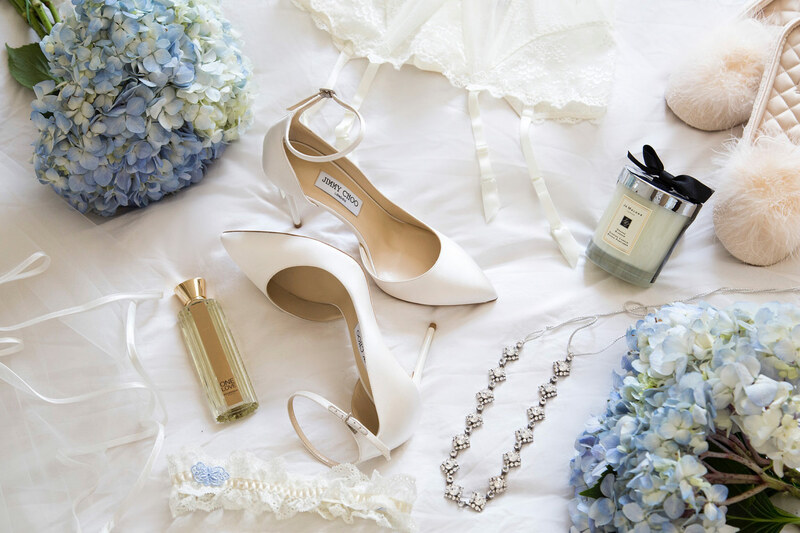 The style of your wedding dress and suits matters when choosing wedding shoes. If you select a formal wedding dress, you will need a matching pair of stylish shoes. A casual wedding dress will go hand in hand a with a pair of white glossy silk white shoes or even any sort of comfy shoes with lashes. Shoes with ankle straps are an option with a short dress. Buy your shoes early, preferably at the same time or shortly after buying your wedding attire. You need to know how well they coordinate with your dress. You will also need to take them with you to your tailor so that your dress can be trimmed and hemmed accordingly. 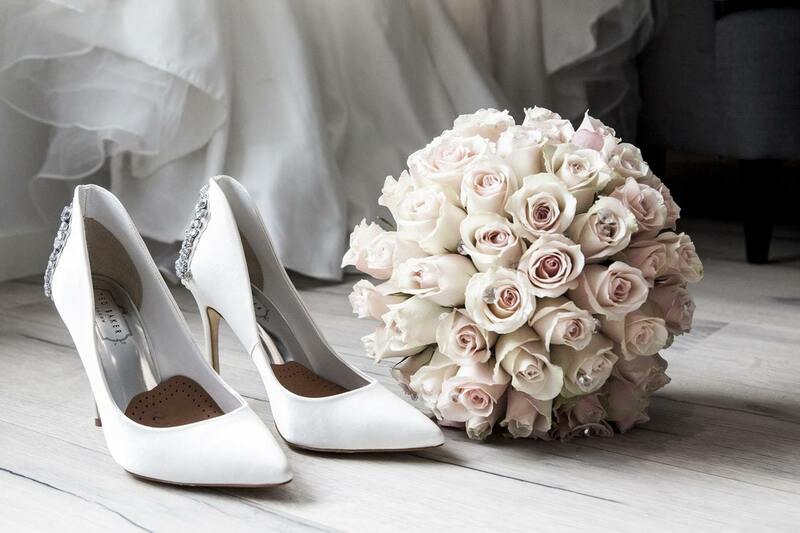 Also for additional comfort on your big day, try to wear your wedding shoes as often as possible a week or two before the wedding to break them in. It is important to consider the wedding venue when selecting your shoes. Are they suitable for your place? If you are attending a lovely summer wedding or even a wonderful wedding on the beach, it may be advisable to invest in an extra pair of wedges or flats for when you are walking on the grass so as to avoid ruining your heels in the mud. However, if you are getting married in winter, you will need a closed pair of shoes to keep your feet warm. This is also an idea for certain venues who may ask you not to wear stilettos so you don’t damage the floor. 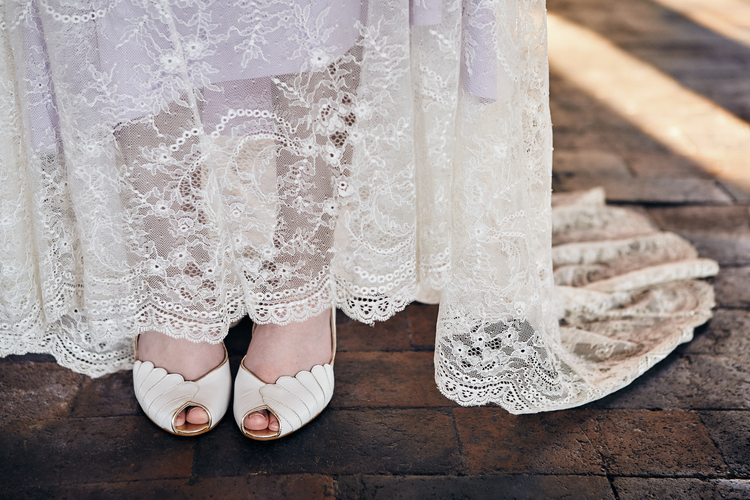 If the heel is not a problem, you can choose open shoes for an outdoor wedding or a more closed option for a winter wedding. Whatever pair of wedding shoes you choose make sure they are comfortable. You do not want to look at your wedding day and remember how bad your feet hurt. Make your feet happy and you will be happy, and obviously, you will have a remarkable wedding day. For more comfortable and beautiful wedding shoes, please check this page.